Born in Lebanon in 1913, (then a part of Syria under the rule of the Turkish Ottoman Empire) he was named Farris Attollah Farris Maroun. He immigrated to the USA at the age of thirteen, unable to speak a word of English. 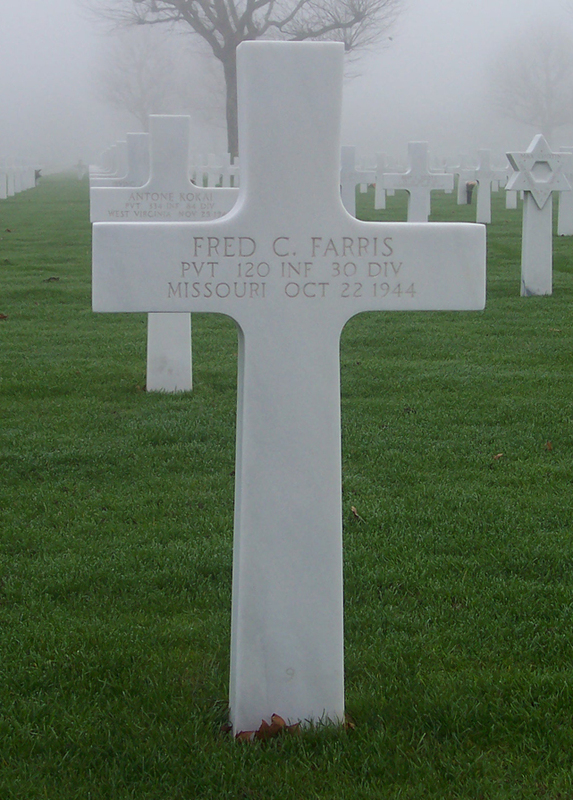 His name was shortened to Fred C. Farris and with the guidance and care of the nuns at St. Francis Xavier parish in St. Joseph, MO. he completed eight years of grammar school in just four years, having achieved the rank of Eagle Scout by the end of this four years. 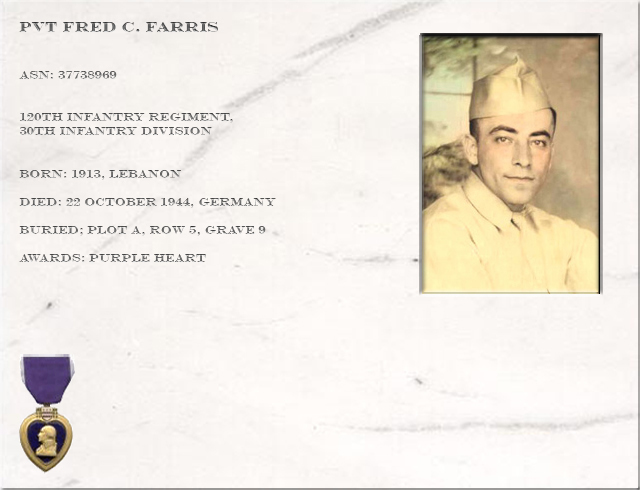 In 1938 he married Louise M. Dawaliby, the daughter of Lebanese immigrants and they had three children, Linda Francis Farris, Charles J. Farris and Phillip F. Farris. Our Dad started his own business, the Midway Tavern and Buffet in St. Joseph, MO., where Army Air Corps troops from Rosecrans Field would frequent for a cold beer and sandwich. One afternoon in March of 1944, he closed his business and walked up the street to the main post office and enlisted (he was exempt from the draft). He volunteered for, and was given, infantry duty. It was only then that he went home and broke the news to our mother. When she asked him why he volunteered for infantry duty, he answered, "I want to fight for my country!" He took his training at Camp Fannin, TX and in September was shipped to England with the 120th Infantry Regiment of the 30th Infantry Division (Old Hickory Division - "Workhorse of the Western Front"-. The 120th Infantry Regiment fought its way across France, Belgium, Holland and deep into the heart of Germany. According to his Commanding Officer, Col. Branner P. Purdue, "his platoon, which had been assigned to the right sector of the company zone had successfully accomplished its mission of clearing enemy troops and had captured 40 German soldiers. During the closing phase of this patrol, the platoon was ambushed, resulting in his death on 22 October 1944." 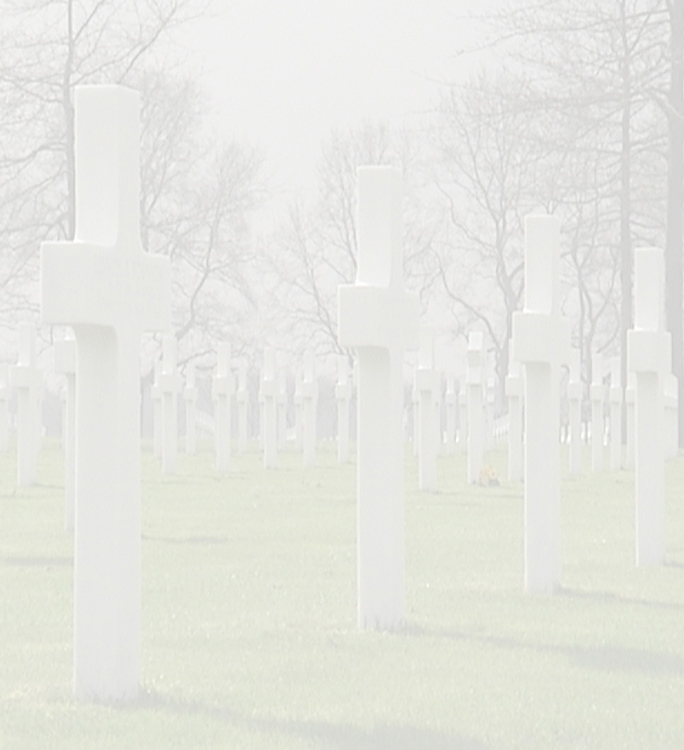 He is buried at the Netherlands American Cemetery and Memorial in Margraten, the Netherlands. All three of Dad's children as well as our mother have had the opportunity to visit his grave in Margraten, the Netherlands. In 2000, I had the honor of visiting my father's grave for the first time. When the caretaker asked me to sign the Book For Family Members ---- well, there is just no way to explain the flood of emotion that had built up inside me since I realized this was as close to my dad as I had ever been since the age of three (I was 59 when I made the trip). I know other members of AWON know what I mean.